96% natural origin ingredients. Dermatologically tested. No parabens. No silicones. 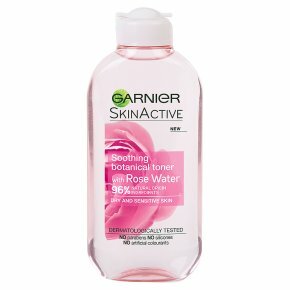 No artificial colourants.Garnier's first toner made of 96% ingredients of natural origin, enriched with Rose Water, known for its soothing power. It removes make up residue and impurities whilst toning your skin and leaving it feeling perfectly soothed. How to use it? After removing make up, apply with a cotton pad onto face.